Have I ever mentioned that Jennifer LaGarde is and will forever be one of my SHE-roes!?! Ever since I discovered her on Twitter, was fortunate enough to sit in on one of her presentations and then actually had the opportunity to meet her, I knew she is what I want to be when I grow up! So, I wasn’t surprised at all when I read her post “Learning To Read Alone Is Not Enough. Your Students Need A Reading Champion” and could not stop shouting, “YES! YES! YES!” I won’t summarize the post for you, but I will say that every point she makes is valid, even though some educators will have a hard time admitting it. Before I became a librarian, I was an English teacher. I always thought that I was a good teacher – my students seemed to really connect with me, did most of what I asked them to and I rarely had problems in class. We had rich discussions, read lots of books and wrote our hearts out. Now, however, when I look back on my 5 years in the classroom, I realize that while I’m sure I helped to make my students more confident, compassionate humans, I’m not really sure that I helped to make them lifelong readers. This is a hard pill to swallow, since I worked hard to be their reading champion. As a librarian, I have an entirely different perspective on reading and its importance and place in education. I believe in giving students choice, yes and I do mean throwing out the whole class novel! But it’s not enough to just give them choice, we have to take time to listen to our kids and help empower them to find things that they want to read. Equipping them with the confidence to make their own reading choices is priceless! I also believe that I can’t be a reading champion for my students if I’m not a passionate reader myself. So, I read, read and read some more. My nose is always in a book and my kids see this. I keep a sign on my desk that shows what book(s) I’m currently reading and I invite my kids to talk about them with me. I ask students what they’re reading and for recommendations. 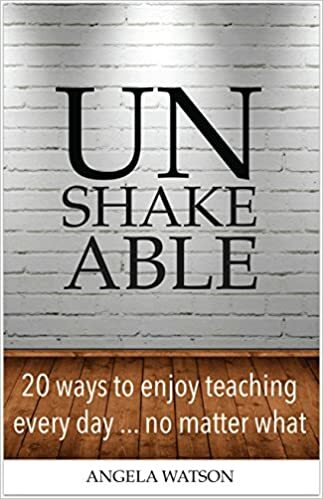 How often have you heard a teacher (who is probably unwilling to change his/her instructional philosophy) say, “If I don’t assign them books, how will I know that they actually read anything?” It’s very simple, just ask them about it. Take the time to engage students in conversations, both oral and written, about what they’re reading. It’s truly a magical thing. I work everyday to reach reading champion status for my students because I know how much reading has changed my life. 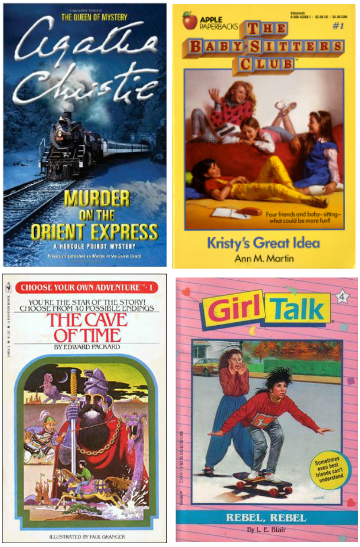 My first book subscription was for Girl Talk books. Thanks Mom! I tore through those books, reading the 3 that arrived for the month is 1 or 2 days. I often found solace in The Babysitters Club series, when I felt like no one understood my quirks. I discovered my love of all things mystery when my grandmother introduced me to Hercule Poirot and Miss Marple. And I realized that girls can love action every time I read a Choose Your Own Adventure book. Every child deserves to feel this way – to lose him/herself in a story and to find him/herself in a character. Sometimes all it takes is one book that they instantly connect with. We have the power and obligation to do this for our students. Regardless of what research says or doesn’t say, what test scores prove or don’t prove, we should strive to be a reading champion for them. I had grand plans to use the entire summer break to work on planning things for the upcoming school year. Unfortunately, Netflix and young adult literature had other plans for me. But, I did stay active on Twitter and continued reading all my blog feeds on Feedly. Finding a balance between working and relaxing was definitely my motto for the summer. I work hard, and sometimes I forget to take breaks. I think my body was telling me that rest was a priority for me and that all the work I am imagining will surely still be there in August. Ok, so I’ve never actually broadcasted live over Periscope, but I’ve watched so many other people do it this summer. I am super excited about this tool. There is definitely debate over its use in the classroom, and I can see how, if used inappropriately or “just for fun”, it could detract from learning, but the possibilities of using it for connecting are limitless. As a librarian, marketing is key to getting kids interested and involved. I have tons of ideas floating around in my head for how to use Periscope everyday to promote the CCHS Library and empower our kids to take more pride and ownership in the space. I’m also thinking of ways to utilize this with colleagues for sharing, transparency and learning. Here’s a great guide to using Periscope in Education that I found on Twitter. For me, finding the best, most effective way to curate content is always a learning process. Not only does the platform need to be quick and painless for me, but it also needs to be easy to use for my students and colleagues. 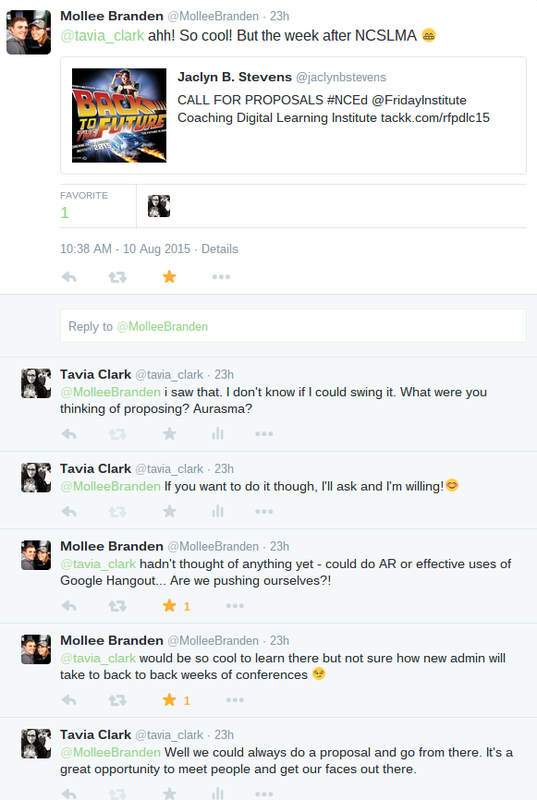 I first read about AppoLearning in a blog post by Steven Anderson. In his post, he talks about the ease of using this tool for content curation. I like the idea of creating collections that can be public, private or shared with specific people. There are countless ways to curate and share content, but I’m excited about this one because of how easy it is to use! I like the sleek, simple interface and think that it is something my colleagues would actually look at and use on their own. I am going to start putting together my first collection, so more about that soon! I LOVE to read and while I read a lot of young adult literature, I try to sprinkle in a professional title here and there. This summer I picked up a few that I want to spend some time at the beginning of the school year working through. I’ve already started reading this book and have posted about my favorite parts so far! This is one that I’ll finish up quickly, probably before students come back. It’s a great book to read before getting the school year rolling to help get the wheels of reflection turning in your head. This book is a little older, but I keep seeing people on Twitter posting about how important it has been for them. 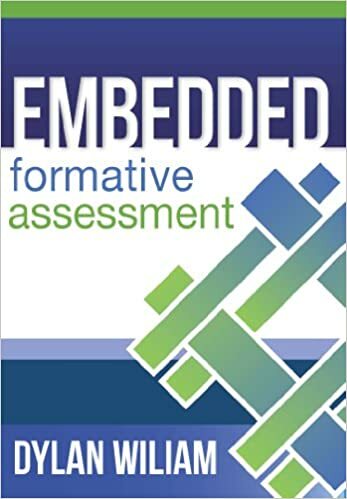 I’m always looking for ways to practice more effective formative assessment in the library and to encourage this in classrooms. I’m hoping this book will speak to me like its reviews say it has to others! Since I have been using the principles from this book a lot through the written conversation method, I figure it’s about time to actually read the book. 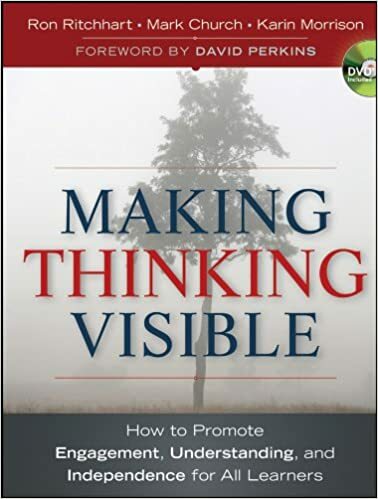 Visible thinking strategies have been very successful with the students I’ve worked with, so I’m hoping to learn more from reading and spark ideas for new things to try this school year. 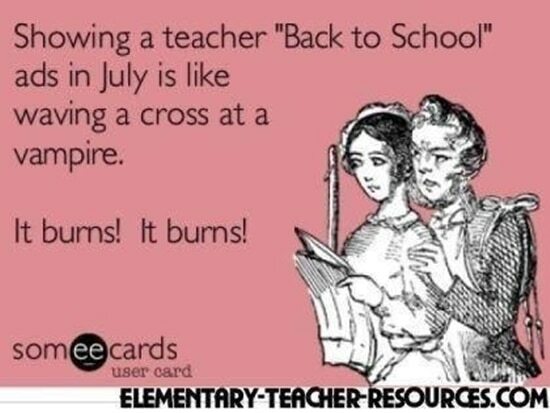 What are you bringing back to school with you this year? Are there tools and resources you can’t wait to try? It’s Monday again, which means this is the last Monday of summer vacation. So here’s to going back to school – the end of sleeping in, only wearing pajamas and all day Netflix marathons. Every teacher should read “We May Not All Be Perfect” by Pernille Ripp before going back to school this year. It’s time to start paying attention to what we do right, even if we’re constantly reminded of what is going wrong. I am so lucky to have such an amazing PLN! Whether we’re connecting virtually or face to face, I am constantly inspired by the work that these people are doing. For me, the best way to grow is reach out and collaborate with others. Not only do I learn more by working with my friends, I am always pushed to go beyond the goals and plans I had set for myself. As summer comes to a close and we prepare to walk into our buildings to start another school year, think about the work that you will be doing. Make sure that your effort is going towards work that you are proud of – work that you know is changing the lives of your students. Also, make it a priority to collaborate, ask for help and not isolate yourself to your own classroom. Everyone needs a PLN that motivates and inspires them! Even if you start small, find one person who you can work with to do amazing things! Find someone who will push you to step outside of your comfort zone. Friends and colleagues like these are the ones you should surround yourself with! Remember, sometimes it’s easier to step outside of the box if you’re not alone! Yesterday, I was able to have lunch with two of my former students who I miss very much. It was so wonderful to talk to them and hear their enthusiasm for life – what they’ve been working on over the summer, how excited they are to move into their new dorms/apartments and how they thirst for the learning that will happen at their respective universities. They have plans, goals and dreams, most of which were born out of their passions, rather than what they gleaned from high school courses. One of the two students, Hannah, asked me if she could take pictures of my apartment and us during the visit. She laughed and said that she needed to capture this moment on her blog! A year ago, when she was about to begin her freshman year of college, she and I met for lunch and talked about her fears and hopes. She is slightly introverted and was worried that she would have a hard time meeting new people, leaving her family behind and just making sense of all of the “new” things that she was experiencing. In an attempt to give her advice, I suggested that she start a blog and capture her journey in a way that would give her the opportunity to tell her story and reflect on her experiences. I emailed her links to some awesome lifestyle blogs that I read everyday, gave her some information on platforms to use and told her that I’d subscribe and read every entry. And guess what…she did it! Hannah started a blog that she’s kept up for the past year! She loves blogging, first and foremost for herself because it helps her grow, it gives her a voice. While her journey isn’t one that I would’ve ever expected she’d go on, I love reading her entries! She has also begun to think about blogging in an entrepreneurial sense. She wants to grow this into something more, possibly into a career or part of her career in communications and public relations. After this visit, I just couldn’t help thinking, “The test score is never the end result.” Our students are people, actual humans who have hopes, goals, dreams, wishes. At some point, even though our evaluations are directly tied to their success on tests, we have to stop only reducing them to data and test scores. I know that you might be thinking that this is easy for me to say, since I’m a librarian and I have no Standard 6 (standard directly tied to students’ performance on state testing), but I am totally invested in my students and my school and our ability as educators to help students realize and reach their goals, fulfill their potential and find ways to turn their dreams into their reality. The sum of the learning that students do must be so much more than performance on a test. We introduce them to so much knowledge, but what are they doing with that knowledge? Are they simply reducing it to multiple choice answers, or are they using it to discover, design, create, and ultimately, change the world around them? This should be the product of their learning. We should be teaching students how to be change agents – how to make the real world a much better place than it is now. So, how do we do this? I don’t even pretend to have all of the answers, but there are a few things I hope to continue to do to help change the product of my students’ experiences with public education. Many students feel very powerless at school. Learning consists of sit and get, pair and share and make a product that the teacher grades. Where’s the power in this type of learning experience? Students need to be given a voice for an audience larger than only the peers and teachers they are accustomed to. Let them blog and tell their stories for a global audience. Seek out partnerships so that the blog posts your students write actually get read. Collaborate with classrooms across the district or state through Google Hangouts. Let students talk to each other about what they’re reading and learning. Give them opportunities to work, virtually with other students to create products. When assigning projects, imagine how the end result could effect change in the community. Give students the chance to apply what they’re learning in school to real world situations with real world audiences. And don’t stop there…help them to figure out how to make this change happen. It’s a magical thing when students see an actual change based on their design and creativity. Give them time to discover their passions. Genius hour, 20% time, passion driven learning…all of these refer to the idea that we give students time, during the normal school day to pick interests and topics that they want to learn about and let them just learn. If given the time, students can discover passions and talents that they might have never believed existed. And this type of learning experience doesn’t just stop at benefiting the student, it can be turned into amazing things that benefit people all over the world. Ask students to create ways to better problems that they feel are serious or relevant to society. Have them create an app to help with something. What about a fundraiser to raise both awareness and money for an issue that is near and dear to their hearts? School is the perfect time for them to test drive their passions and to find out what they feel is important. Allowing students this freedom transforms them from merely students into scientists, mathematicians, writers, coders, builders, designers, philanthropists. In addition to giving them more direction for the future, it shows them that we (educators) are invested in them on a personal, human level. Students need choice, even if it seems to scare them. They need to be given ownership over their learning so that they become more invested in it. Having teachers tell you everything is easy. Not having to think about making, doing, creating is easy. Avoiding decisions about how to structure your own learning or the product of that learning is easy. But, what does giving students the easy way out accomplish? It certainly doesn’t make them value education and it definitely doesn’t promote the idea that school doesn’t equal test scores. I know that we have to live in reality and that standards, tests, bureaucracy all exist. We can’t escape the politics of education. However, we don’t have to make students’ experiences with learning revolve around those politics. Giving students choice can be simple. Maybe you ditch the class novel and begin to allow students to read whatever they choose. Instead of requiring that the final product of research be a formal paper, allow students to create multigenre projects that include various modes and platforms to display their learning. If you’ve always made students follow specific guidelines for how they structure notebooks in your class, try giving students time to design their own form of notebook that will be more conducive to their personal learning style. Rethink assessments and allow students to show mastery of Math and Science concepts through coding or building. We don’t all learn the same way, therefore, we need choice – choice in not only how we learn, but in how we show what we’ve learned. 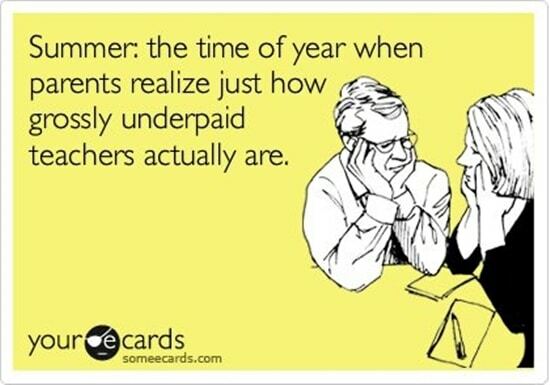 The struggle is real and we (educators) are all a part of it. It’s time that we stop blaming the politics of education for education’s shortfalls, and start taking matters into our own hands. We can control how our students perceive school, by giving them the opportunity to take ownership of and become more invested in their own learning. 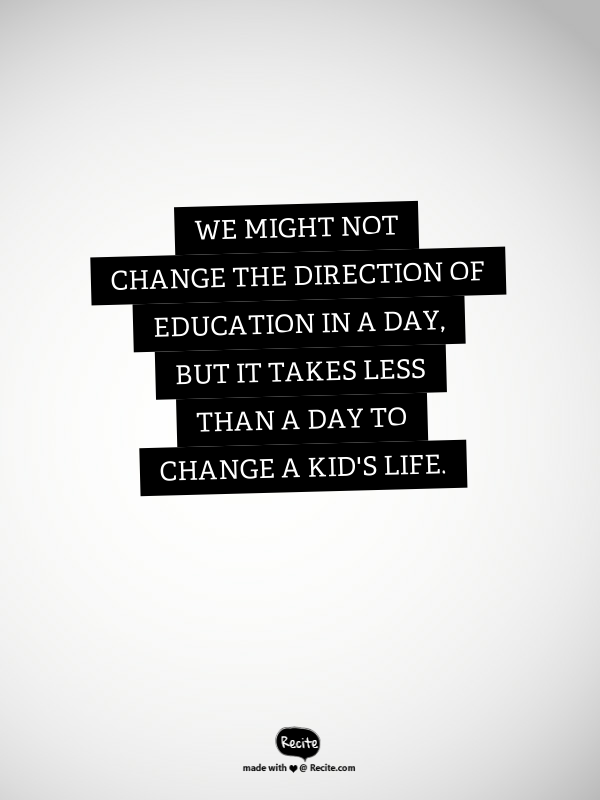 We might not change the direction of education in a day, but it takes less than a day to change a kid’s life. 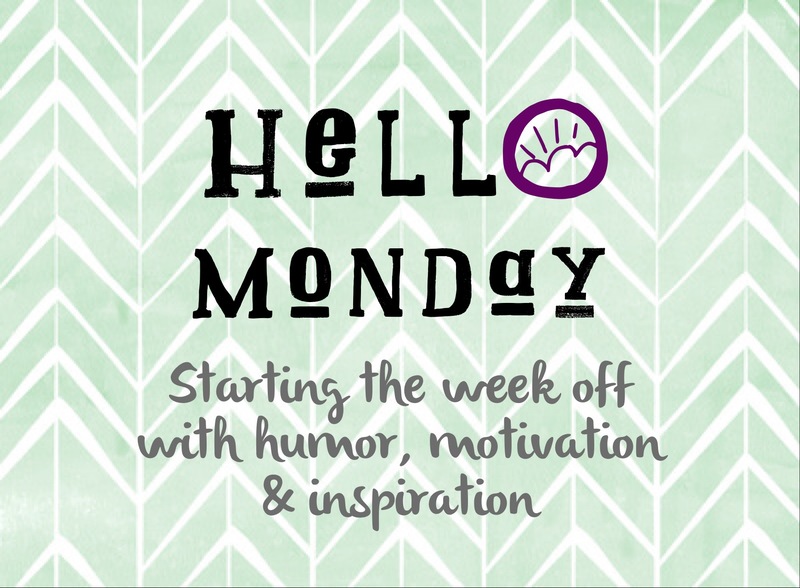 Let’s begin the week with a little humor, some motivation and things that inspire me. 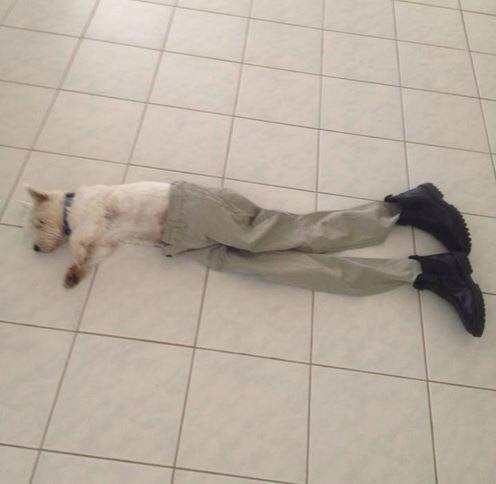 Dogs with pants. Need I say more? 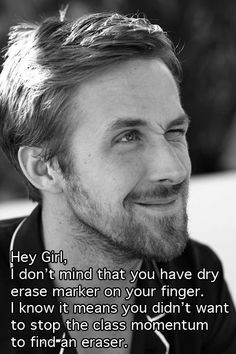 I swear, these never get old. This tweet made me so excited. Mollee and I have worked so hard on Quick Tech by TM and while we were met with only slight interest from our colleagues, we believe in what we’ve created and will keep pushing forward. Thank you Corinne for your kind words! 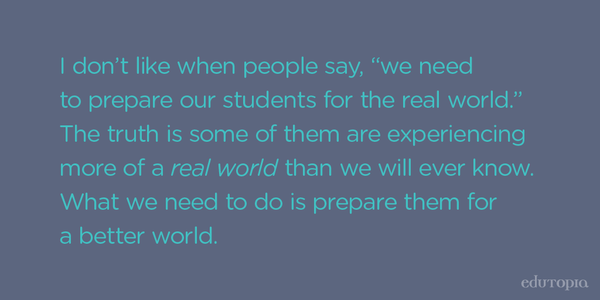 I have to say that I’m guilty of saying “prepare our students for the real world…” just as much as the next educator is. But when I read this, it really hit home. Our students are a part of the real world everyday. For some of them this reality is amazing, nurturing, more than fair. However, for many of our students, this reality is disheartening, toxic, unsafe and dream killing. I love the idea of taking students where they are, where they come from and preparing them for a world that is far better than the one we live in now – a world that they help to create.